This is our first challenge and it is so much fun! rosette die that makes the 2.5 inch rosette. then sanded to expose the white core of the paper. "Where did she find that stamp set?" of Mary's "Thankful for You" stamp set. 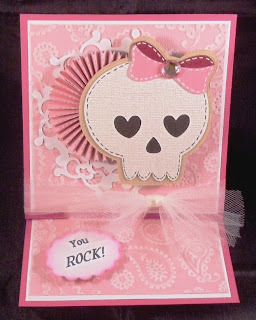 I love your card and I love "Your Style", Julie and I'm so honored to have you on the Cardz TV Design Team! 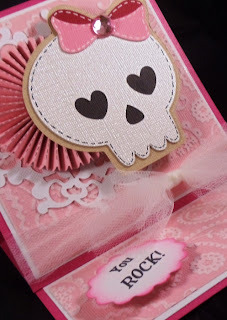 I like your style and love the eyes on the skull. Thank you for sharing your style. Beautiful card, Julie. I love your style. It is an honor to be on DT with you. This is so pretty. I love the color that you used. Great card! Love the pinks and the skull. You ladies are very talented in Mary's DT!!! I really like this, great job! love it!! You are doing so well! Congrats on making Mary's design team!! I remember when we both started our blogs the same day...and look at you now! I haven't done a darn thing with mine!! Marianne has been on me so maybe I will get it going!! Fabulous card, Julie. Love the feminine look with the twist of the skull. The snowflake looks so lacy underneath and I love the tulle bow. I love this card Julie! The paper rosette looks great with the papers! what a cute card Julie! Very pretty in pink!!! Great job!! 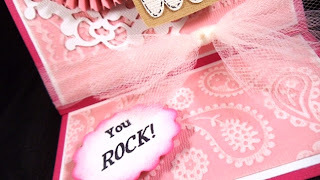 Your card is just to cute & I love all the pink! 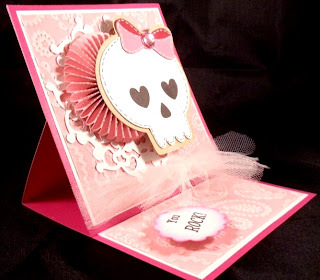 Your card is just adorable..I Love it.